HydroCork by Wincanders manufactured in Portugal is unlike any other LVT flooring on our website. It incorporates a cork composite core rather than a standard resin core; ultimately adding a handful of benefits to the Hydracore LVT line of flooring. The state of the art cork core will enhance the comfort of the vinyl floor as well as the acoustic and thermal insulation properties of the room that it's installed in. HydroCore is also more resistant to impact, more silent when walked upon, and easier on the joints. HydroCore is also water resistant and will not swell when exposed to water like other flooring types might. 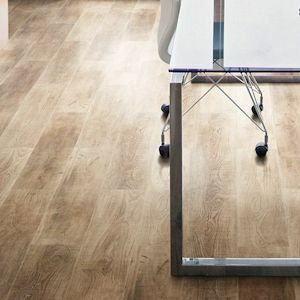 This LVT is incredibly easy to float over a myriad of existing flooring surfaces and the patented compression system PressFit locking system creates a stable and strong connection between planks for a quick and easy installation. It's super easy for D-I-Yers, as the only tools you will need are a measuring tape, a utility knife and a rubber mallet. Moisture barrier only necessary for below grade installations. Wicanders HydroCork LVT comes in a variety of wood plank visuals, which you can browse through by clicking on the link below. The HydroCork Collection from Wicanders offers all the beauty of a hardwood floor combined with the durability of a LVT and the comfort and performability of cork! Features a 21.5mil wear layer, 6mm overall thickness, IIC Rating of 61, STC Rating of 62 and Square Edges and Ends.